Observing properties of microbial microcosms, such as organism size and population density, often cannot be carried out in situ, and usually cannot be performed for the entire microcosm or every individual therein. Hence, observations are virtually always made on a sample of the microcosm, and usually involves removing this sample from the microcosm (though see below for exceptions). Important questions include what volume sample to remove, whether samples will be returned to the microcosm, when to sample, and whether to homogenise microcosms before sampling. There is no single correct answer for any of these questions, though most often microcosms are homogenized by swirling prior to sampling. How to answer these questions for one’s specific situation is discussed in the troubleshooting section. How frequently to sample depends on the goals of the experiment, and on the rates of interest. For example, at least daily sampling during exponential growth phase is desirable to get a good estimate of growth rate while less frequent sampling may be enough to get estimates on the carrying capacity. Note that these protocols deal with sampling alone (i.e., physically withdrawing a sample). Other sections (e.g., section 2.2 Microscopy) deal with taking measurements from the samples. A sterile pipette (or pipette tip and pipette). A vessel into which the sample will be placed. This might be for storage until a measurement is made, or directly into a measurement vessel (e.g., a Sedgewick Rafter counting chamber or a petri dish). Culture media with which to replace sampled volume. If sampling is sensitive to movement of the microcosms, do not move the microcosms. If sampling is not sensitive to movement of the microcosms, or requires it, remove microcosms from their experimental environment. Swirl the microcosm if the contents needs to be homogenized. Prepare the pipette ready for extracting liquid (i.e. put a clean tip on) and keep this in one hand; it is important to do not put the pipette on the bench at this stage to avoid contaminations. Use the other hand to move the microcosms lid aside. Remove the required volume of culture, and immediately reseat the lid. Do not remove the lid and place it on the bench; only move the lid aside, and keep it in hand. Squirt the sampled volume into the appropriate vessel. If necessary, replace the same volume of removed media with fresh media, following general good practices (cross reference to these). Replace the microcosms as soon as possible in the experimental environment. Make whatever measurements are required. Figure S1. A sample being taken from a microcosm. Photo by Florian Altermatt and Owen Petchey. Preparation of fresh media for replacement takes at least two days. Steps 1-11, with good organization and practice, take as little as one minute. What volume to sample? This will depend on the population densities of the species to be sampled. Lower population densities required larger samples, higher population sizes required smaller samples. If microcosms have been homogenized before sampling, and this has distributed individuals randomly, one can assume the observed number of individuals in a sample is Poisson distributed with mean of the population density in the microcosm. Low population sizes and small samples can easily result in zero individuals counted, which should be avoided if possible, as zeros can make some analyses problematic. Should samples be returned to the microcosm? Smaller samples generally need not be (e.g., 1 ml or less), and their equivalent volume can be replaced with fresh culture media. 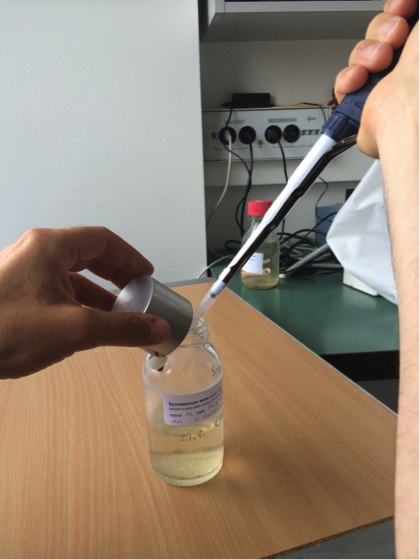 Larger samples can be replaced, but care should be taken not to introduce contaminants (e.g. by using disposable vials to place the sample while making measurements, or by disinfecting the non-disposable ones with ethanol followed by rinsing them with deionized water). How often to sample? This will depend on how fast are the dynamics, and recording of any transient dynamics is required. Some experiments may require only recording of the end state, while others may require highly resolved time series. Whether to homogenise before sampling, for example by swirling, depends on whether disturbance in spatial heterogeneity are acceptable. If they are not acceptable, perhaps because the experiment concerns the consequences of small-scale spatial heterogeneity, population densities should be estimated at a fixed position in the microcosm, or at several fixed positions. There is relatively little evidence that swirling as often as every other day has large effects on population dynamics. A sample ready to take measurements from.